9 -pc. Tumbler Set. Eight 12-oz. 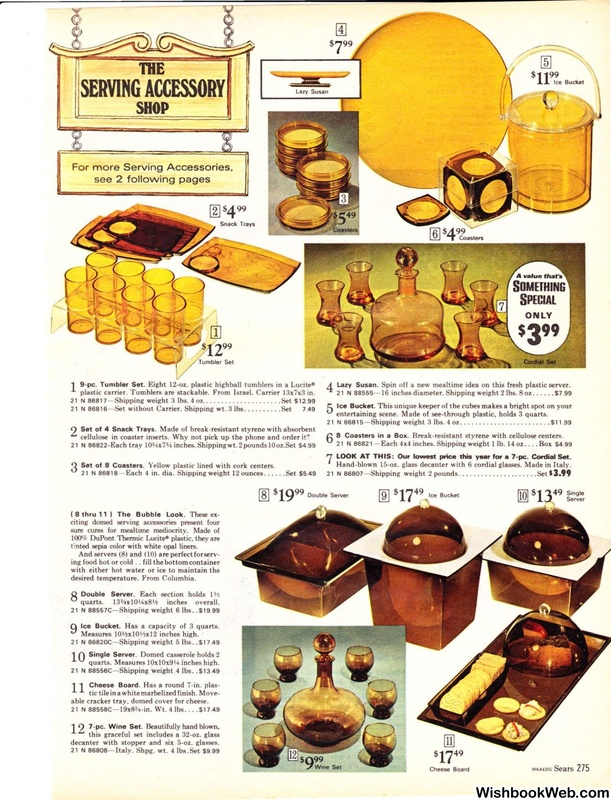 plastic highball tumblers in a Lucite"
plastic carrier. Tumblers are stackable. From Israel. Carrier !3x7x3 in. 86817- Shipping weight 3 lbs. cellulose in coaster inserts: Why not pick up the phone and order it? Coasters. Yellow plastic lined with cork centers. Lazy Susan. Spin off a new mealtime idea on this fresh plastic server. 86B15- Shipping weight 3 lbs. Coasters in a Box. Break-resistant styrene with cellulose centers. Hand-blown 15-oz. glass decanter with 6 cordial glasses. Made in Italy. tinted sepia color with white opal liners. Ice Bucket. Has a capacity of 3 quarts. quarts. Measu res 10x1Qx91;.1 i'riches high. able cracker tray. domed cover for cheese. decanter with stopper and six 5-oz. glasses.